For those familiar with IPEVO and our range of document cameras and software, you’ll probably know about our free Visualizer software and the tons of features packed into it. In fact, we are always working on adding new features to Visualizer and fine-tuning the current ones based on feedback and suggestions we received from our users so as to cater to their different needs. And now, we are excited to introduce you to the latest release of our Visualizer software that has a refreshed look and more features.Note: For optimum performance, we suggest that you use Visualizer with IPEVO document cameras. The latest version of Visualizer includes a feature that allows users to switch to a larger user interface. This “enlarged” version of Visualizer has a simpler interface with bigger icons that was specially designed for our low vision users. This is part of our ongoing efforts to increase the usability of our products and software for those with low vision so that they will be able to benefit from our affordable solutions. Simpler interface with bigger icons! Check out the “enlarged” version of Visualizer designed for those with low vision. Zoom in on your materials by as much as 12x using the Zoom feature of Visualizer. From educational to business settings, from zooming on hard-to-read text, intricate patterns of artwork, needlework, origami to more, you can enlarge details of your materials for all to see and do away with crowding around tables for your teaching, presentations or demonstrations. Zoom in for all to see. Now there’s no need to crowd around tables! Magnify is a new option added to Visualizer for zooming your materials. It differs from Zoom in the way it enlarges the live image. In Zoom, the whole of the live image is being blown up, meaning you’ll lose sight of the entire object if you zoomed in too much. Whereas in Magnify, you get to choose which part of the live image you wish to enlarge. This provides you with the convenience of magnifying selected areas of your live image while keeping the entire object in view. Magnifying and showing a selected area of a circuit board. As its name suggests, you get tools such as line marker and magnifier to aid you in reading with this newly added feature. A single press on the icon will display a line marker designed to help you keep your place while reading. It comes in really handy when you are doing group readings as it makes it easier for your audience to follow. Reading would also be more enjoyable and less frustrating for those with low vision with the help of this line marker. A magnifier is also included for enlarging your reading text. You would find this extremely useful for reading fine print of your medical prescriptions, mails, important documents and more.Note: Reading Aids is only functional in Snapshot and Video Recording mode. Reading fine print made easier with the help of line marker and magnifier. We hope you find the improvements made to Visualizer useful. Any feedback or questions? Please do let us know! How teacher Andrews Carrie use Ziggi-HD Plus USB Document Camera in the classroom. How teacher Lambert Jim use Ziggi-HD Plus USB Document Camera in the classroom. 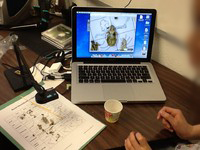 How teacher Leigh Jennifer use Ziggi USB Document Camera in the classroom.